As we’ve established, I love pears, and one of the flavor combinations I love best is pear with dark chocolate. A couple months ago I made a delightful brown butter cake with pear and bittersweet chocolate, which was quite a revelation, flavor-wise. 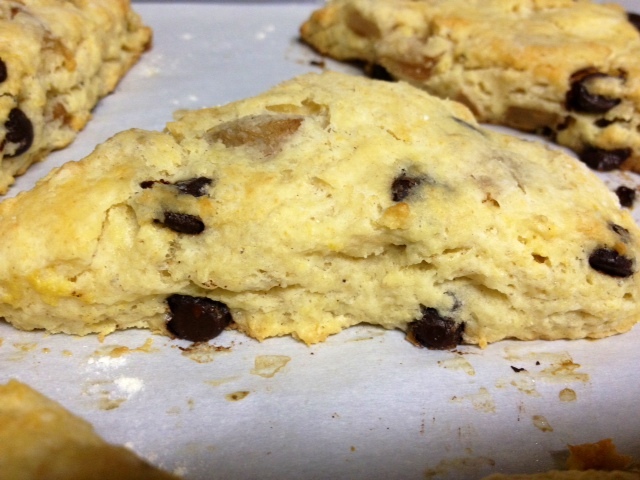 So a couple days later I tried out these pear and dark chocolate scones, but decided to tweak the recipe a little and add in that brown butter flavor. Brown butter really does add another layer of flavor to things, but it’s an extra step in baking so you can decide to just use all cold butter instead (they’ll probably be a little fluffier). I’ve done a separate post with detailed steps and photos of how to brown butter, if that’s helpful. Preheat oven to 375°F. Peel and core the pears, and cut into small chunks. 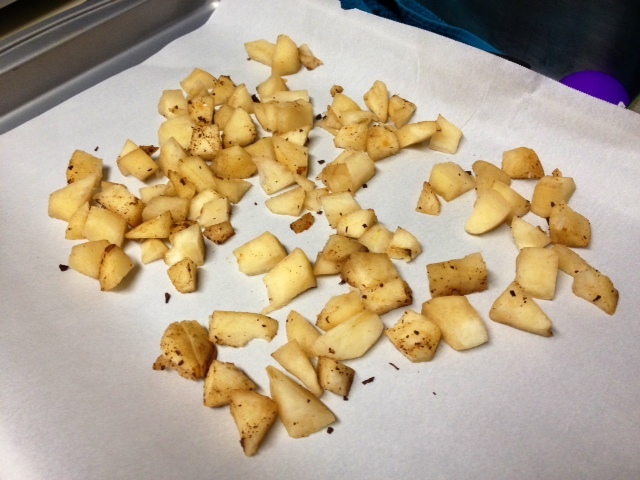 Line a large baking sheet with parchment paper and arrange the pear chunks on it. Roast until they feel dry to the touch and look a little browned underneath, about 20 minutes. Cool til lukewarm, but leave the oven on. Go ahead and line baking sheet with another piece of parchment. While the pears are roasting, brown the butter so it has time to cool. In a tiny saucepan, melt 2 tablespoons of butter and keep heating and stirring (scraping the bottom to make sure there aren’t brown bits) until it turns a lovely golden brown. Don’t have the heat too high for this, around a 5 on my stove probably. Cool to room temperature. 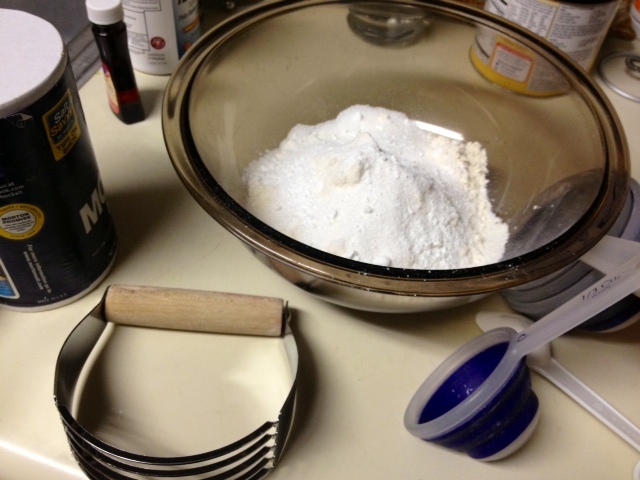 Whisk the flour, baking powder, 1/4 cup sugar and salt together in the large bowl. 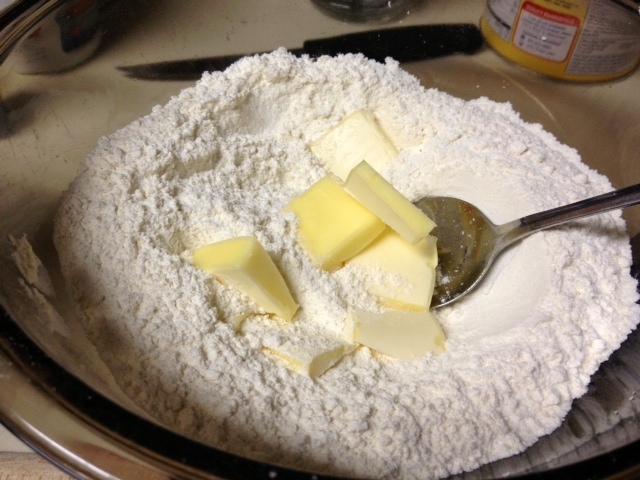 With a pastry blender, cut the cold butter into the dry ingredients, they should be tiny, tiny bits. 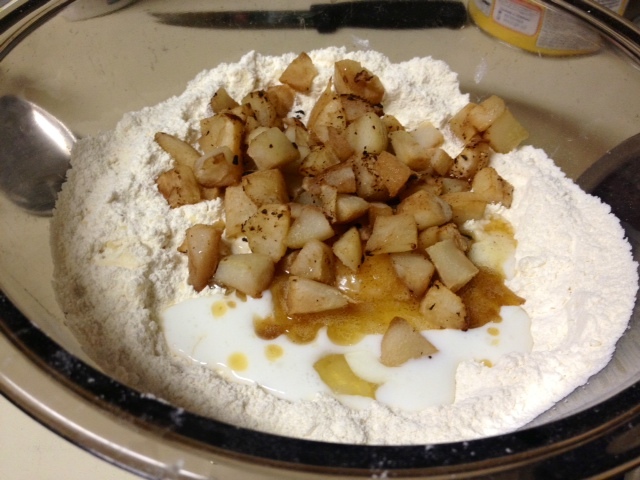 Add the cooled pear chunks, buttermilk, cooled brown butter, almond extract, and 1 egg. Stir very gently until just combined, but don’t overmix. Stir in the chocolate chunks. If you have baking chocolate or from a bar, chop that up and use it. I thought I had it but came up empty, so I used dark chocolate chips instead. 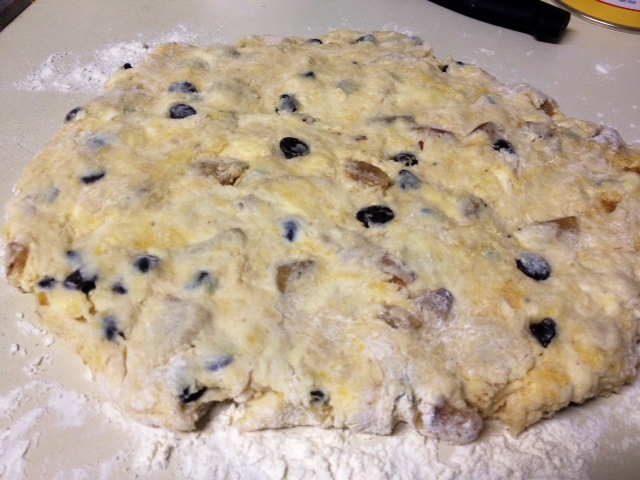 Heavily flour a counter and pour the dough out onto it, gathering into a ball and then patting out into a round shape. It should be about a half-inch thick. Cut into wedges and transfer to the prepared baking sheet at least two inches apart. If you’re using an egg wash (which I was too lazy to do this time, but highly recommend), whisk the remaining egg in a small dish with 1 teaspoon of water and a pinch of salt. 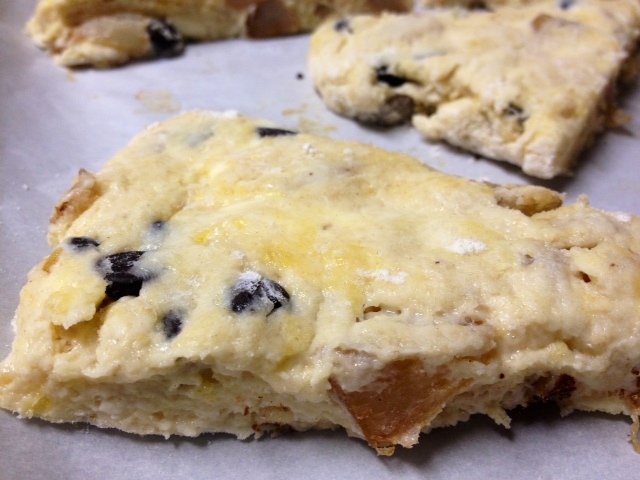 Brush each scone with the egg wash and sprinkle with remaining tablespoon of sugar. 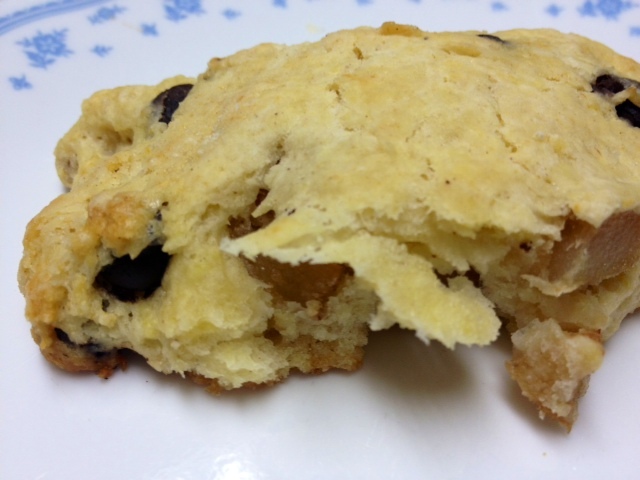 Bake scones until firm and golden, about 20-30 minutes. Transfer to a cooling rack. 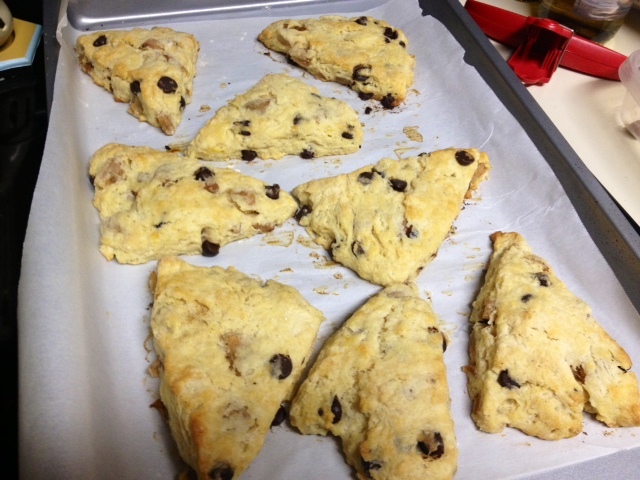 These were such a good flavor combination, though a little crispier than I like in the outside of a scone. I may play with the browned butter/cold butter ratio—the browned butter flavor didn’t really come through, but the cold butter is what makes it fluffy and light, so both elements are important. 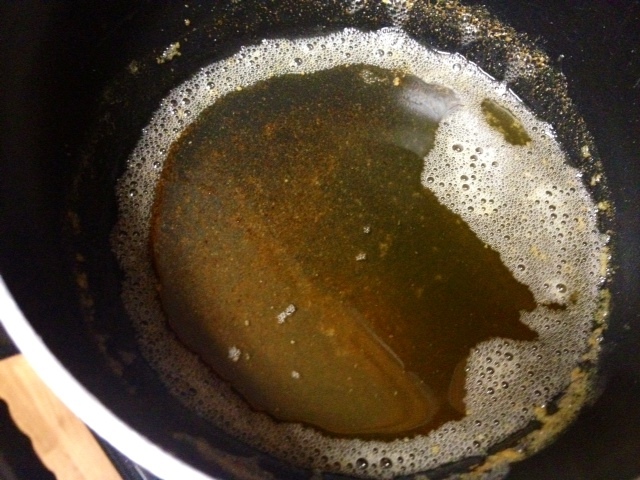 In a tiny saucepan, melt 2 tablespoons of butter and keep heating at about 4-5 on your stove until it browns, stirring constantly to scrape any brown bits off the bottom. Cool to room temperature. 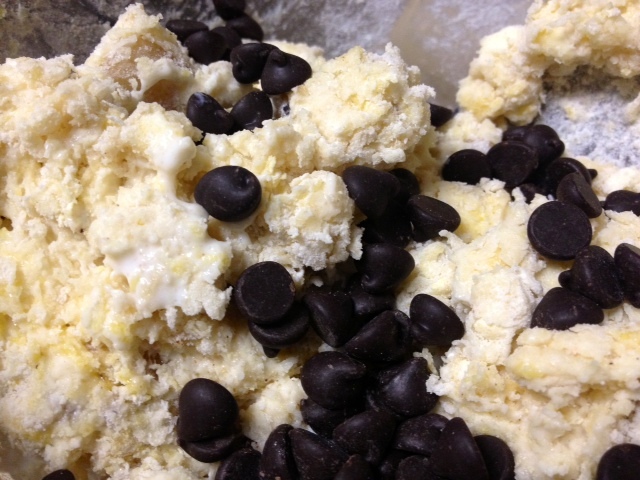 Whisk the dry ingredients (flour, baking powder, 1/4 cup sugar and salt) together in the large bowl. Cut the cold butter into the dry ingredients using a pastry blender, then gently stir in the cooled pear chunks, buttermilk, cooled brown butter, almond extract, and 1 egg. Don’t overmix. Stir in the chocolate chunks. 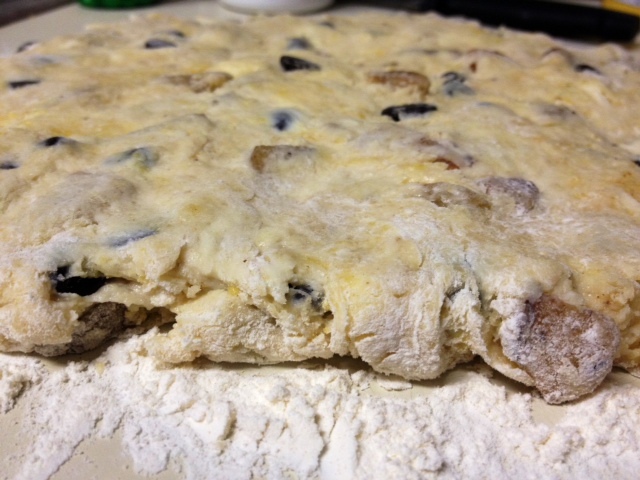 On a well-floured counter, pat out dough into a round shape, about a half-inch thick. Cut into wedges and transfer to the prepared baking sheet at least two inches apart. If using an egg wash, whisk the remaining egg in a small dish with 1 teaspoon of water and a pinch of salt. 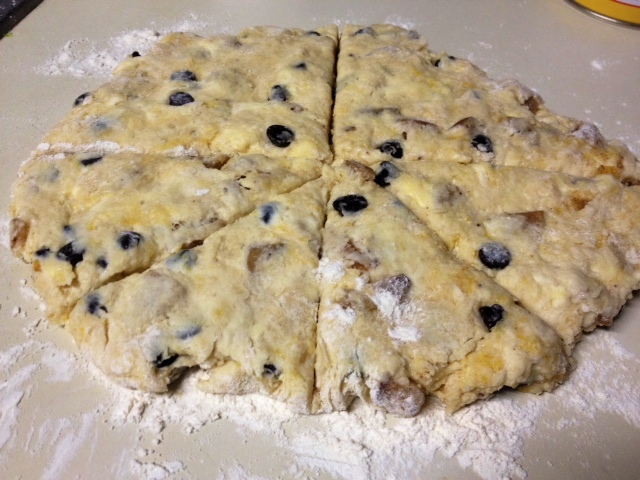 Brush each scone with the egg wash and sprinkle with remaining tablespoon of sugar. 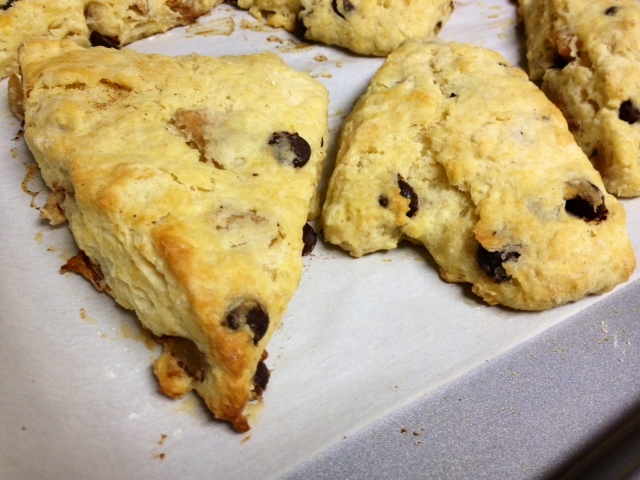 Bake scones until firm and golden, about 20-30 minutes. Transfer to a cooling rack.